Fashion and clothing is one of the most important industries globally, accounting for a major contribution to the economies. Despite being seen by many as an industry that is frivolous and indulgent, the global clothing and apparel industry is a serious contender nonetheless. Cotton as a commodity is one of the most important raw material that is central to the fashion industry, the clothing and apparel market at large. Cotton is also a commodity that is traded as a futures product that is standardized and cleared at an exchange. The relationship between a futures commodity such as that of cotton, and the retail sector is often debated and widely covered. Therefore, it is common to find someone asking the question whether futures prices have an impact on the end product where it is used. In the context of this article, it is interesting to learn how the price of cotton futures can influence or impact the price of clothing in the retail sector and the fashion and clothing industry at large. Due to the fact that the futures asset that is traded reflects in part the actual supply and demand of the product in question, the rising or falling prices has some kind of impact on the final end product without a doubt. The question is how much of an impact the raw material has. 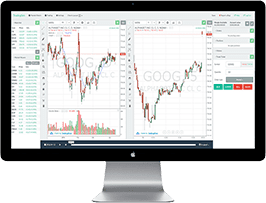 For example, one of the easiest relationships to ascertain between the futures markets and the retail world is the crude oil or even the gasoline futures prices. Although the prices reflected in the respective futures commodities represent the commodity as the raw material, the end result (the fuel used at the gas stations) has a relationship with the futures prices as it is only one of the input costs. The final costs are of course determined by other variables such as taxes, demand, distribution and so on, with of course, the price of the raw material contributing to the influence on the final pricing as well. To truly understand how cotton futures have an impact on the global apparel industry, it is important to look at the factors that influence the prices of the cotton futures which are responsible for the overall impact on the industry. What factors influence the price of cotton futures? 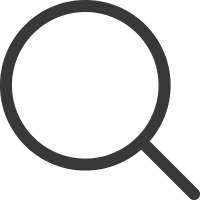 iPath Pure Beta Cotton ETN (CTNN) and iPath Bloomberg Cotton Subindex Total Return SM ETN (BAL) are two of the top most cotton ETFs for stock investors for investors who wish to track the commodity from a retail perspective or for general investing purposes. The apparel market is valued at $3 trillion according to data from FashionUnited which is said to account for nearly 2% of the global Gross Domestic Product (GDP). The womenswear industry is the biggest, valued at $621 billion, followed by menswear which is valued at $402 billion. Although the industry has been going through a tough period recently, the outlook is expected to be brighter according to McKinsey. And the changes in the outlook over the past years did not see any major changes as the price of cotton futures has been relatively stable. In the past decade, the apparel industry is estimated to have grown at a pace of 5.5% annually. The retail clothing and apparel industry is no doubt one of the biggest and influential and depends on a number of factors. In fact, McKinsey ranks the global apparel and clothing market as the seventh largest economy, if ranked according to GDP and alongside the individual countries. The apparel and clothing industry is often influenced by changing trends in the fashion industry which in turn have an impact on the demand side of the business. Therefore, cotton is often seen competing with other fibers as well and this change in fashion trends can play a major role. 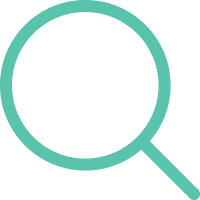 These changes can often be independent of the supply or even cost factors and therefore, it is important to keep track of the changing trends in the clothing and fashion industry. When it comes to the prices of the cotton futures, there are a number of factors that producers, merchants and speculators look to in ascertaining the right prices and from a trading perspective as well. The most important is of course, the U.S. Department of Agriculture (USDA) forecasts. According to recent reports, the department's data showed that the world cotton output has been in a steady decline, falling at the rate of 5.4% in harvest from major producers. The U.S. output for cotton is also expected to fall by close to 2.1 million bales to 141 million bales. Meanwhile output from China, one of the major cotton producers is also expected to fall by 2.0 million bales. Producers or cotton farmers also need to focus on crop disease which is an important element in determining the crop output which can eventually influence the global cotton futures prices. Crop disease is an important risk to agricultural commodities that can wreck havoc and can bring unseasonal shifts in the markets concerned. Cotton prices are also impacted by the oil prices interestingly. Among all the agricultural commodities, cotton is said to have the highest per-acre energy costs and thus, higher oil prices tend to have an impact on cotton prices as it can increase the input costs which can result in higher prices. Besides crop disease, the weather also plays an important role in determining the output of cotton and the resulting prices, which can impact the supply side of the markets. Because rainfall is essential to the cotton plants, droughts or even floods can wreck havoc with the crop. It is estimated that cotton plants require 24 - 48 inches of water annually and irrigation costs plays a major role in impacting the prices as a result as the higher prices can quickly add up significantly and build up into the initial price. 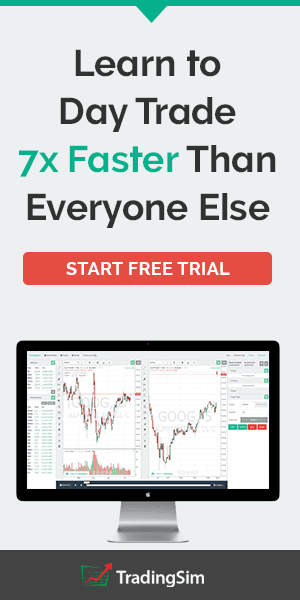 From a trader’s perspective, for day trading, cotton futures are one of the ideal markets to trade due to the volatility and of course the margin requirements. 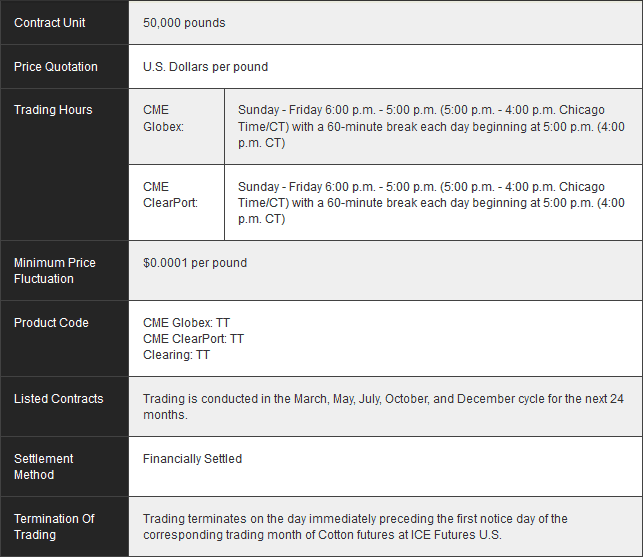 The cotton futures contracts are available for trading on the CME exchange as well as the ICE futures exchange and the image below gives an overview of the futures contract specifications. 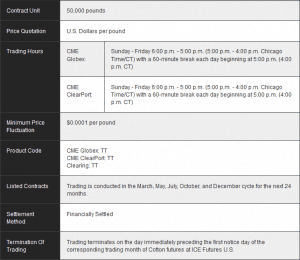 Between the two exchanges, the ICE futures exchange cotton contract are cheaper to trade compare to the CME futures exchange contracts. Traders should also bear in mind the different ticker or symbols for the cotton futures for both of these exchanges. While cotton futures prices have an impact on the input costs for the manufacturers, the cotton prices tend to impact the end product in some aspect. Although due to the fact that clothing sales are often determined by fashion trends, the general state of the economy, prices and so on, the effect of cotton futures are limited. In order to understand the impact cotton prices have on the global retail trade, it is important to know some of the factors that influence the trade. One of the biggest competing raw materials for the apparel industry to cotton is polyester. Polyester is a cheaper alternative to cotton and the material has been in a state of oversupply which has helped many manufacturers to opt for Polyester. The fact that it is a cheaper alternative translates to lower prices for the end consumer making it more popular among manufacturers. Thus, the raw material cotton is often seen competing with polyester. This also comes amid the fact that China, India and Pakistan, which are the top three global cotton producers, have been facing problems ranging from factors such as floods, drought and tighter restrictions on exports. Besides being one of the globally top producers for cotton, the above countries are also regions of high demand for the clothing/apparel business and thus, China and India especially play a big role when it comes to determining the trends and prices of retail clothing. The economy also plays a major role in determining the supply and demand factors for cotton. When the economy is weak, the consumer's spending power is also relatively weaker tends to hit the bottom line sales of the apparel, this tends to have a chain reaction leading to lower than expected requirement for cotton as a raw material. Government policies also play a role in shaping the price of cotton prices. This is due to the fact that governments across most of the cotton producing nations have put in place the various subsidies and measures in place in order to insulate cotton farmers from the price volatility. It is widely documented that one of the central variables that determines the price of cotton is the policy directive from the Chinese government. One of the primary reasons used is for cotton prices trading below their cash value. The cotton producers in China have been known to stock on the raw material in an effort to make prices more competitive amid creating shortage in the markets. The government subsidies can change from time to time and is also another factor that can influence prices of cotton that needs to be accounted for, both for traders who wish to speculate on the cotton futures prices as well as long term investors who want to invest in the retail clothing and apparel sectors. Among the retail clothing industry, companies such as Under Armour, American Eagle, Tommy Hilfiger, Coach, Michael Kors and Gap are some of the top companies in the world. The fashion and clothing industry is one that is dynamic and fast changing and depending on the trends, demand can be expected to rise and fall accordingly. 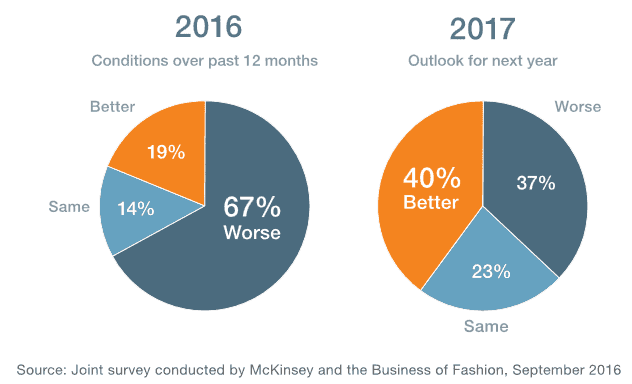 It is estimated that in 2017, the retail fashion and clothing industry is expected to remain stable. Sales are expected to grow around 6% - 8% for the year, mostly on account of global demand. But the pace of growth in the retail clothing sector is facing stiff competition from other retail sectors that include healthcare, rent, and electronics and so on. Politics are also expected to play a big role in shaping the outlook for the retail clothing sector, especially as the current U.S. administration continues to pursue uncertain economic and trade policies. Thus, in conclusion, the cotton futures prices tend to play a significant role in impacting the global apparel and clothing industry. However, considering the fact that clothing manufacturers are now open to more choices, cotton is facing stiff competition from polyester and other fibers which are cheaper. Besides the pricing factor, the more recent reports from the United States Department of Agriculture (USDA) showed that the world ending stocks are projected to decline in the years 2017 - 2018. This is expected primarily on account of decline in stocks from China. Therefore, the market is expected to tighten a bit more largely on the supply side than on the demand side of the scale. Besides China, the forecasts for growth in the use of cotton are moderate with an estimated 1% growth while non-Chinese production is expected to rise for another year. Meanwhile, the U.S. cotton exports are expected to remain steady at the rate of 13.2 million bales for 2017 and 2018. While the supply side tends to affect the cotton prices which in turn impact the global retail industry, the trends and demand also pays a major role. When fashion trends dictate that consumers prefer other fibers to cotton, manufacturers have to oblige, which tends to have a reverse effect on the cotton, as it reduced demand for the raw material. Therefore, cotton and the retail apparel and clothing industry can see a tight relationship which can affect prices on either side of supply and demand.